What is 2014 NEC 690.12 all about? NEC 2014 690.12 is being implemented to protect first responders from elements of a PV system that remain energized after the AC service has been shutoff. Twenty one states are adopting all or parts of 690.12 this year making rapid shutdown a concern for everyone involved in solar energy. The rapid shutdown methods shall be labeled as such: PHOTOVOLTAIC SYSTEM EQUIPPED WITH RAPID SHUTDOWN (in white, capitalized, reflective letters on a red background). Equipment that performs the rapid shutdown shall be listed and identified. 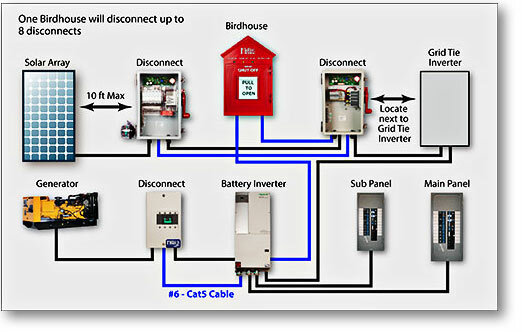 Unlike systems based on DC contactors, the Birdhouse works with grid tie inverters that employ an AC outlet designed to work during a power outage. 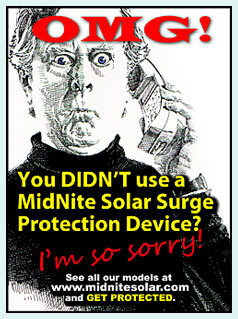 Contactors shut off the PV array during power outages. The Birdhouse waits until the button is pushed. Unlike systems based on DC contactors, the MidNite system provides hardwired audible and visual feedback that tells the first responder that the PV array, grid tie inverter, battery based inverter and auto start generator have been shut off. Contactor based systems have no feedback. 600VDC contactors can and do fail short, so without feedback cannot be relied upon. The Birdhouse gets its power from the PV array during the day, utility at night and from battery backup when all other sources are not present. The Birdhouse can be connected to a structure’s fire alarm to automatically shut the PV array down. Multiple Birdhouses can be installed on a single system that contains up to eight high voltage shut offs or combiners and numerous battery based shut offs. All downstream shut offs will fail safe in case of a burned through or damaged cable. 10 seconds from a clearly-marked central switch before venturing onto a rooftop for firefighting. Disaster averted! And may the sun continue to shine!